I am creating a course/assessment that has a short answer question. When I try to submit/complete the create of this project it keeps saying "please answer the short answer questions". I've provided answers, but obviously not correctly. Can someone help me determine who to provide the answers for short answer? Hi there! Can you please provide me with a link to the course? I'll take a closer look at the problem. I see that you're in the "edit" menu right now. If you'd like to test it out, go to the "view" menu and answer the questions as if you were a student, then the submit option should work just fine. Ahhh, yes I was clicking the "submit" button. You're awesome! Thank you! 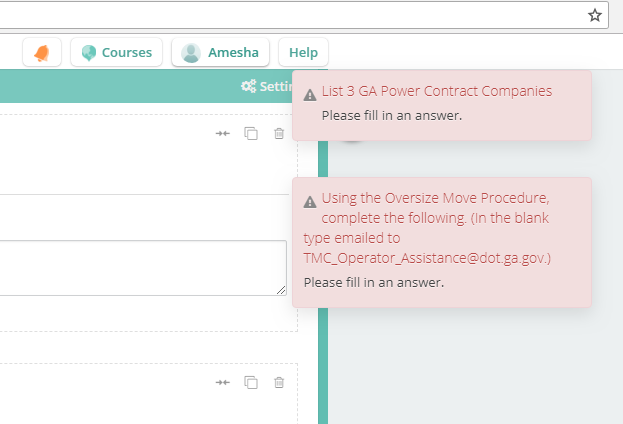 Another question, I did a practice run and now my answers are still showing even after going to a different page. Is there a way to clear the answers? Amesha No worries! When a student (in this case, yourself) answers the questions, they're only viewable by that student. So even though you can still see your own answers right now, no one else can. I double checked just to be sure. Here is a view of the page from my end. All answers are still blank. Also, Omnaya Omar , how do I share this for others to take this course? I want to see if it works when someone is given the link?